Chemoprevention is the use of drugs, vitamins or other agents to try reducing, delaying or preventing the development of cancer. Dr. Michael Sporn is known as the “Father of Chemoprevention” because much of his research has dealt with the development of new drugs that can be used as chemopreventive agents. Throughout his career, he has been involved in the synthesis of several hundred naturally-occurring molecules called triterpenoids. These molecules have potent preventative effects, including anti-inflammatory, anti-proliferative, pro-apoptotic (cellular suicide) and cytoprotective effects. The triterpenoids could be used as agents against several types of cancer, including breast, lung and pancreatic cancers. For individuals at especially high risk, the promising results of Dr. Sporn’s research offers hope that there could be new and safe drugs for cancer prevention. In addition to studying synthetic triterpenoids for cancer prevention, Dr. Sporn has also looked at other chemopreventive agents including, synthetic retinoids and rexinoids, synthetic deltanoids and selective estrogen response modulators. Moreover, throughout his career, Dr. Sporn has not only profoundly influenced the fields of cancer biology and chemoprevention, but also immunology, inflammation, oxidative stress, wound healing and embryonic development. Michael B. Sporn, M.D., received his bachelor’s degree from Harvard University and his medical degree at the University of Rochester. Dr. Sporn then started a 35-year career at the National Institutes of Health, where, in 1970, he was made the Head of the Lung Cancer Unit and, in 1978, became Chief of the Laboratory of Chemoprevention. In 1995, he became the Oscar M. Cohn ’34 Professor of Pharmacology and Medicine at Dartmouth Medical School. 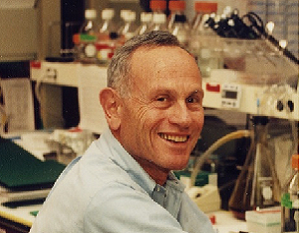 Throughout his career, Dr. Sporn has received many honors and awards, including the 1982 Lila Gruber Award for Cancer Research from the American Academy of Dermatology, the 1991 American Association for Cancer Research’s Bruce F. Cain Memorial Award, the 1994 Mider Lecture Award from the National Institutes of Health, the 1994 Medal of Honor from the American Cancer Society, the 1998 Bristol-Myers Squibb Award for Distinguished Achievement in Cancer Research, the 2002 Award for Excellence in Cancer Prevention Research from the American Association for Cancer Research and Cancer Research Foundation of America, and the 2005 Brinker Award from the Susan G. Komen Breast Cancer Foundation. In addition to his past funding from NFCR, Dr. Sporn’s work has been supported by the Breast Cancer Research Foundation, the National Institutes of Health and the American Association for Cancer Research. Dr. Sporn is also a member of the American Society for Biological Chemistry and Molecular Biology, the 2004 National Cancer Institute Eminent Scholar, a Fellow of the American Association for the Advancement of Science and presented the American Cancer Society Award Lecture in 1996. Dr. Sporn is the author of more than 500 research papers and has sat on various Editorial Boards and Advisory Boards throughout his career, including for Cytokine and Growth Factor Reviews, Cancer Research, the Journal of the National Cancer Institute, the Journal of Neurochemistry, the Journal of Biological Chemistry and Cancer Prevention Research. Your ticket for the: Michael B. Sporn, M.D.